Day 4 Giveaway (Lush Decor Curtains) and Some News! Just over 3-1/2 years ago we moved from FL to TN (if you want to know all the places we lived before that, you can read my About Me page). After getting the kids settled in school, I found myself needing an outlet and diy beautify was born! It's been a fun 3 years with lots of learning and growing, both my blog and me personally. That's why these last few days have been all about celebrating and giving good things away! I hope you don't miss out on today's giveaway, it's the last one for awhile and I'm also announcing the winner of the Sweet Tea fabric giveaway below...aaaand I hope you'll keep reading because we are heading out on a new adventure! I have some big news! The diy beautify family is moving to Texas! Next week is the big move, so we have been busy busy busy packing, purging and getting our minds wrapped around this new adventure God has in store for us! I admit I don't know too much about the great state of TX, except it's big...and hot...and home to the Aggies! Do you live there? Quick...what deets do I need to know? We have a lot of changes just around the bend! A new state, new climate...new people, new schools, new views out of the window! A new house to decorate and make a home!! I won't lie, all this change is a bit frightening! Especially because it's all happened so fast that I've barely had time to catch my breath! By this time next week, little DIY will be starting 7th grade in a new school! However, I know that God holds our future and He'll be with us each step of the way. So all this new, scary stuff is a little bit exciting, too! I will still be blogging and sharing my decor decisions and DIY adventures with you, but I may need to take a few days off to get settled. I hope you understand. As I've been purging items I no longer want and find myself dreaming about a new home, I know I want to make a few changes in how I decorate. How that will look exactly, I'm not sure yet. It all depends on the house we find. I just know that I've been absolutely astonished at all the stuff we've managed to accumulate...and I'm a little weary of it all! Many, many bins and boxes and bags have found their way to Goodwill over the last couple weeks! Don't worry, I'm not going to turn all minimalist on you! But I want to be very strategic as I decorate a new home, filling it with things I love and use rather than just things! Do you know what I mean?? And I can guarantee you that there will be shiplap somewhere in my new home! Mr DIY, have I got a project for you!! I know we all desire to live in homes where we feel comfortable and can relax...rather than feeling overwhelmed by all our stuff, right?! So although today marks the last giveaway, it's a good one - a functional one - a pair of gorgeous (affiliate link) striped blackout curtains from Lush Decor! I would love to use curtains just like these in my new home! 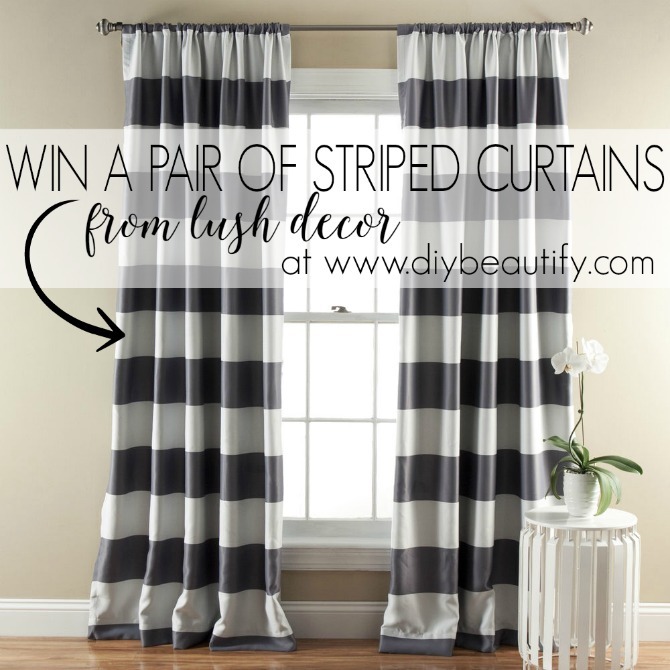 There are 7 colors to choose from, and the winner gets a pair of curtains in their color choice! 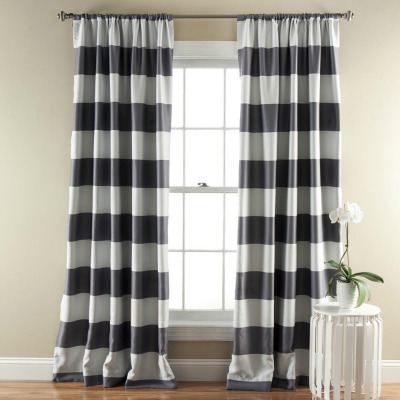 Beautiful curtains are like icing on the cake when you're decorating a home! Good luck! The winner will be notified by email on Monday morning, August 15. I won't be posting that day as I'll be flying to TX! Thank you for your understanding, patience and prayers as we make this transition! The winner of the Sweet Tea fabric from Thistlewood Farm is Diana (diana.1stmetmortgage@yahoo.com) Congratulations! Thank you to Lush Decor for sponsoring this giveaway! Cindy, I do live here and there are lots of us here!! What area will you be living in? I live in Rockwall near Dallas. We have an active and fun group of bloggers who get together and support each other. I hope you are coming in my direction. Good luck to you and your family in Texas! Just wanted you to know the coffee mugs arrived safely and quickly, and I'm enjoying using them. Thank you so much!